A bar magnet PAF style bridge or neck humbucker pickup inside a P90 Dogear that requires no modifications to your guitar at all. Its essentially the standard humbucker design of two coils with bar magnet and steel pole and/or screws. A completely direct drop-in replacement with your choice of Alnico 2, 3, 4 or 5 magnets. Warmer, classic humbucker tones with the option of more traditional 6 visible pole screws and hidden steel slugs under the cover or 12 visible pole screws. P90 Dogear covers, although made of plastic, are quite thick meaning the hidden steel slugs are just that little bit further away from the strings whereas the full set adjustable pole screw option means all 12 pole screws can be adjusted to suit your neck radius or to dial in individual strings for emphasis. I offer both these options as some customers prefer the more vintage humbucker 'look' whereas others want more clarity & definition. A great replacement humbucker for standard P90 Dogear Pickups and if you'd like a PAF style replacement humbucker for your Les Paul Jnr Guitar. 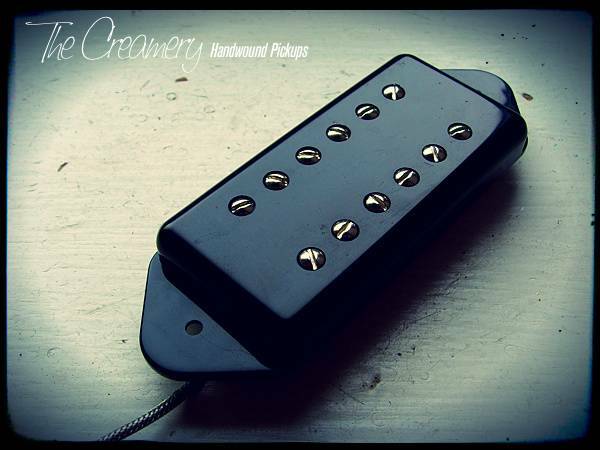 You can find more details of my Creamery Custom Shop Handwound Replacement P90 Pickups here.